While the more interesting action has shifted to funding markets, the treasury curve remains at least relevant to the analysis of all those ebbs and flows. 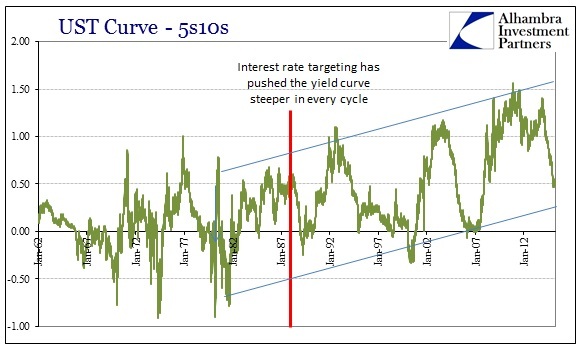 For the most part, the yield curve in UST has found itself stuck in a rather tight range right at the bottom of the “cycle.” While that would be noteworthy in one or two segments by themselves, that the entire curve remains flattened through all the nominal ups and downs is significant. It bears close resemblance to the negative funding pressures in “dollars”, reflective of economic perceptions demonstrated along time values. The 10-year yield has swung rather sharply of late, from a January low of 1.66% to the most recent high, of that March 6 selloff, of 2.24% (closing level CMT). The 5-year, despite its increased susceptibility to policy “considerations”, has moved in almost exact tandem with the 10s. Even the 2s and 30s, despite their nominally disparate trajectories, are quite linked more recently in the general up and down motions of their respective nominal yields. Again, that would seem to suggest a unifying governing dynamic apart from just what convention about the FOMC mood suggests. 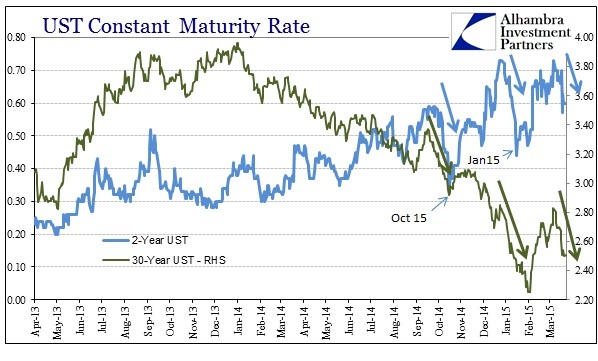 So it is remarkable, again, that through all these obvious inflections tied to systemic liquidity the yield curve remains overall nearly static as flat. As I have said before, that may be the most important element of at least the treasury market view of the financial and economic nexus. There is a tendency to fixate on absolute numbers, especially round numbers, as if their easy divisibility denotes actual meaning. In this context, the yield curve and recession are believed to be utility of mathematical inversion when such “rules” may no longer apply. Instead, by view of historical changes that shifted the entire paradigm, absolute inversion may be far less important (or not at all) than relative changes. 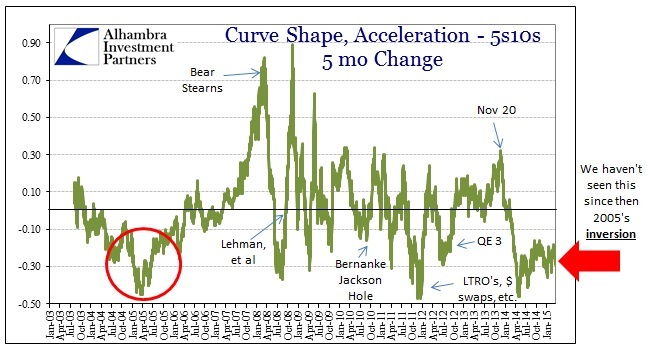 To be blunt about it, the Federal Reserve under interest rate targeting clearly and artificially shifted the treasury curve toward steepness; they did so as a means to influence investor behavior and, as silly as it sounds, mood. In other words, the yield curve is not made solely out of actual market and fundamental conditions, but of influence from decidedly non-market political action (actually only threats of action that have been forced only since 2007). Since that steepness never before existed, as actual time value in fundamental perceptions never “needed” it, the related intention of monetary policy under this paradigm to accomplish steepening more than suggests it is reasonable to assume it as nothing other than a monetary artifact of that design. Given that station, there is no real reason to believe that absolute levels bear any similar resemblance to signals of past function. 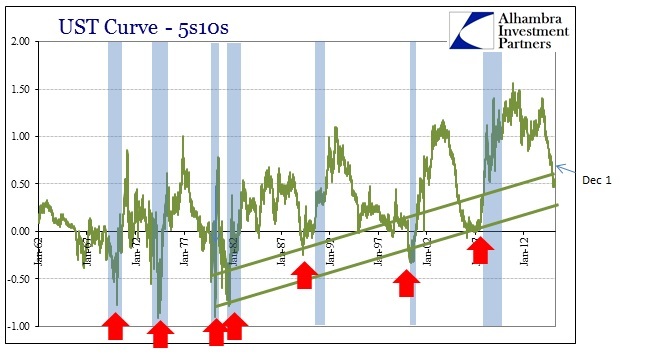 Where the yield curve in the all-important belly of the 5s10s might have deeply inverted in the past just prior to recession, there is no justification to expect the same attainment of absolute levels where artificial monetary intrusion has pushed the curve much, much steeper. Instead, rather than focus essentially the triviality about zero, what may be truly important is the actual movement. This appears particularly relevant where it is sustained over more than a few months, as the latest flattening trend remains in place despite the passage of now sixteen months. That is no small occurrence to be cast aside solely because it once led to a negative calendar spread – again, the important point is not the negative sign but the fact that relative bearishness remains unaltered by serious events in close proximity. This assertion is buoyed, I believe, by the fact that there seems to an inverse relationship between artificial steepening and actual economic function. The yield curve has been the steepest it’s been post-war in the 2000’s coinciding not with tremendous organic growth but “puzzling” stagnation and disutility. 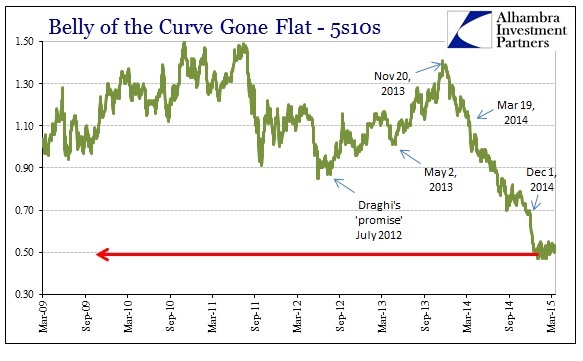 I am actually quite surprised by the behavior of the past few weeks, as I would have expected that the yield curve would have steepened at least somewhat noticeably during the “dollar” pause of late, if only to collapse backward sometime after March 9. Maybe UST investors are simply taking the path of least resistance, looking ahead at generalized liquidity and the “dollar” and not bothering to get much excited about any end to the seemingly perpetual “dollar” downside. Unfortunately, it is entirely unknowable as to how much artificiality the Federal Reserve has visited upon credit markets. 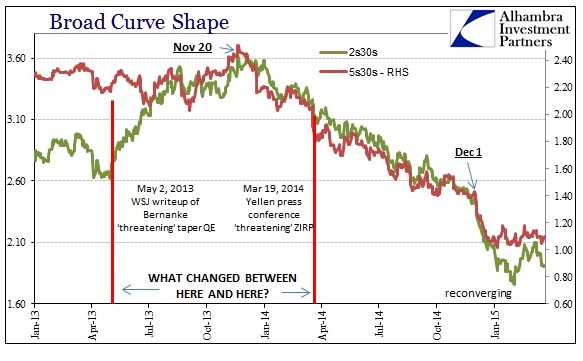 We can reasonably assume it’s not small and trivial, even in the last two decades where eurodollar construction roamed freely and unconstrained, but especially in the current “cycle” given ZIRP and four QE’s. I think that makes this stable bearishness all the more remarkable and again significant. 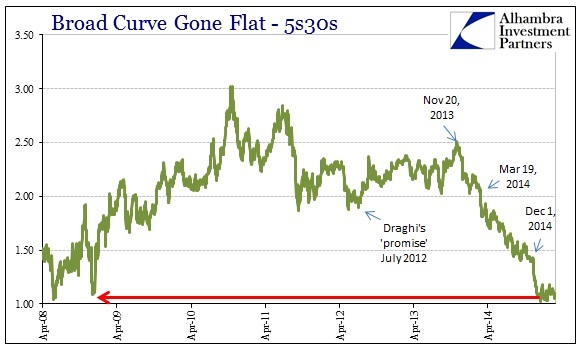 The FOMC has thrown everything they can think of at the yield curve to push it back to something like 2003 but to no avail beyond the immediate aftermath of each QE implementation. That makes the current context not just consistent with prior relative changes toward flattening, it actually emphasizes it even further. The “dollar”, it would seem, is far more powerful than anything the Fed can devise, a functional reality I highly doubt was considered when they took their activist approach sometime in the 1980’s. That may well be the enduring legacy of the eurodollar transformation, especially post-1995 as this new “dollar” not just supplanted the FOMC’s dollar but even the ability of the central bank to induce influence beyond the purely cosmetic calculation of absolute numbers. 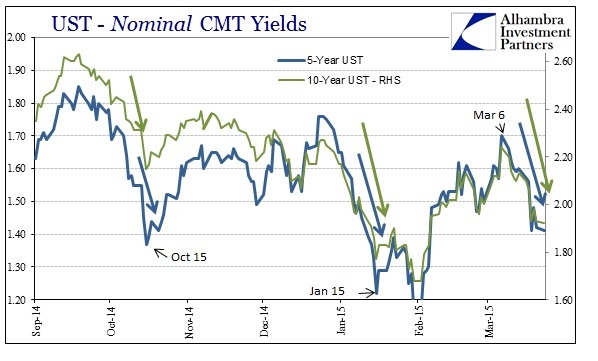 In other words, the artificially steep yield curve is a reflection of policy intent not economic reality. Monetary theory suggests that influencing actual behavior in this way leads to reality from the illusion, but the economic decay of this century means the only misdirection here is of policy theory. The inverse is thus quite damning, as a flattening curve in opposition of policy intentions is wholly significant in and of itself especially if it is sustained.